on virtual trips to places all over the world. 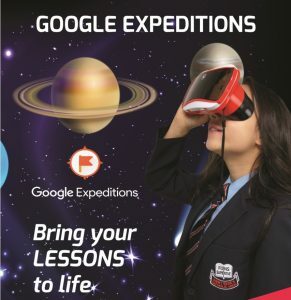 Google Expeditions enables teachers to bring students on virtual trips to places all over the world. Expeditions are collections of linked virtual reality (VR) content and supporting materials that can be used alongside existing curriculum. Take a walk through museums and cities to explore art, music, literature, and religion from around the world. From propelling into outer space to examining the inside the human body, discover science through a new perspective by taking students on some of these Expeditions. Take students on a dive into the ocean, on a climb up a mountain or even on a flight over an active volcano. Discover different environments throughout the world through these Expeditions. Discover what the it was like to live in a different time. From roaming with dinosaurs to going into the trenches of war, see history through the eyes of those who lived before us. Visit monuments from around the world to gain a deep understanding of the significance of these landmarks. Walk through art, science, and history museums around the world.